Are you finding oil drips underneath your car every time you park? By replacing your rear oil lines, you eliminate one of the most common sources of oil leaks on your air-cooled Porsche. Your air-cooled Porsche 911 has a built-in oil cooler bolted to the engine case under the fan shroud. As engine displacement grew over the years, the factory eventually added an auxiliary oil cooler under the right front fender well, with a pair of long oil lines and an external thermostat connecting it to the oil tank and engine. If your car has a significantly oily right rear wheel well, this procedure will take care of the most common oil leak in that area. 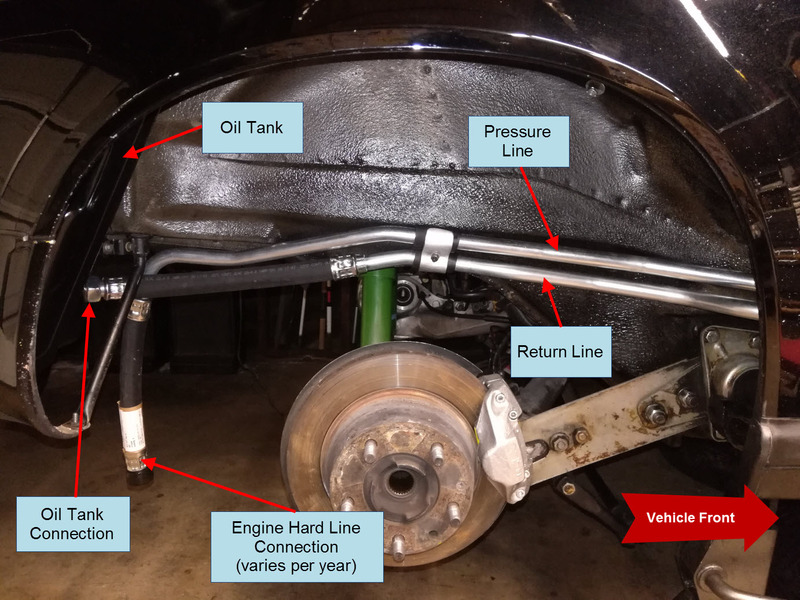 This DIY applies to Porsche 911s from 1974-1989 as well as earlier cars that have had a 1974+ style front oil cooler and thermostat added. They're virtually the same with slight variations in the pressure hose due to different exhaust systems. The specific installation we're covering here is the 1978-1983 style. Note: 1973 and earlier cars had several different styles of external oil coolers and oil lines that will not be covered here. Oil is carcinogenic so wear rubber gloves, long sleeves, and safety glasses to protect your skin. Work in a well-ventilated area with no sources of heat, spark, or open flame when using a propane torch. Keep a fire extinguisher within reach. It's recommended that you lift the entire car up on jack stands using step 2C of this procedure. The reason is that you will need as much wrench clearance as possible around the external thermostat located near the floor of the car. Additionally, it should be lifted fairly level to ensure all engine oil can drain towards the back of the car. Now, you can remove the right rear wheel. Locate the two oil lines clamped against the right rear wheel well. If you follow them towards the rear of the car, one will end at the oil tank, and one will end at the engine. If you follow them towards the front of the car, both should terminate at the external thermostat tucked in the front lower corner of the wheel well. 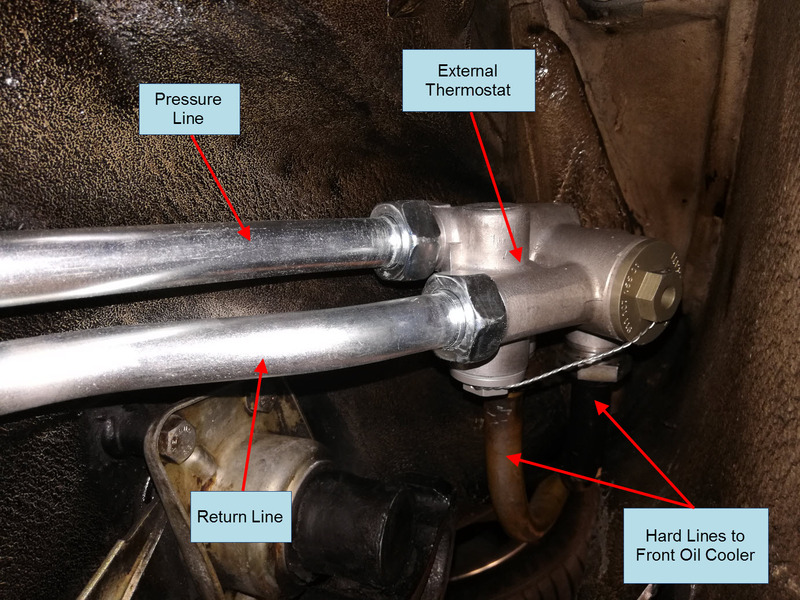 The pressure line goes from the thermostat connection to the engine hard line. The return line goes from the outer thermostat connection to the oil tank. Take note of this, so you re-install the new lines correctly. Label each line and connection with a piece of tape and a permanent marker to help you remember how they orient after you remove them. Also, both of these rubber lines commonly leak around any of the crimped connections. If you can afford to wait, apply penetrating oil on the large hex nuts on each end of the rear oil lines and let it soak for a day or two. This will make them much easier to loosen, especially on the thermostat end. These are large fasteners that likely have not been touched since the car left the factory. Spray a little on every few hours. You are required to drain the oil tank, so you might as well do a complete oil change and drain all of the engine oil. Follow steps one through four of this procedure to drain your oil and change your oil filter. If you have recently performed an oil change and still have relatively new oil, you will still need to thoroughly drain your oil tank and store the oil in a clean covered container to re-use once you're complete. 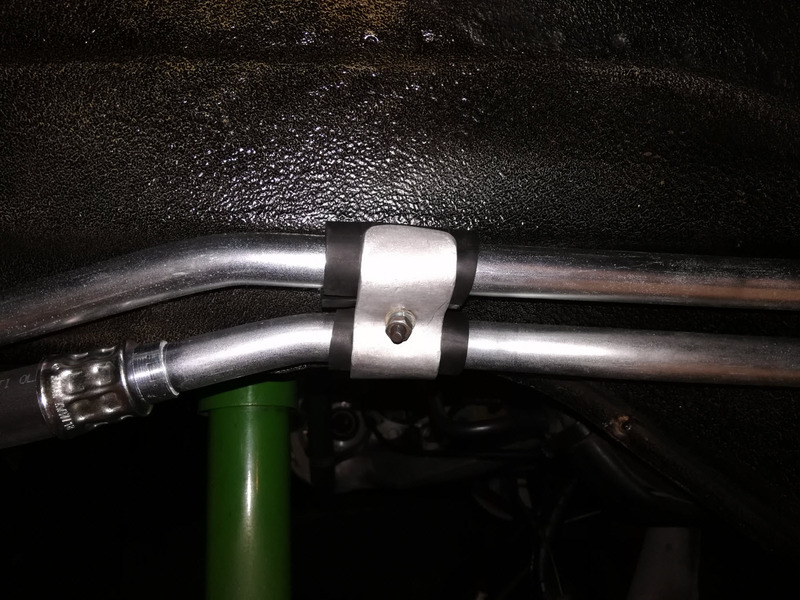 Since we're working with oil lines connected to the thermostat, it's essential to fully drain the oil while the engine is warmed to ensure the thermostat is open and all of the oil in the hard lines and oil cooler fully drains out. Remember to exercise caution as the oil will be hot. Empty both of the oil pans because you will need them again when disconnecting the oil lines. Place an empty oil drain pan under each end of the oil lines to catch any drips. We will first try to disconnect the lines at the thermostat as these connections are usually the ones most likely to be stuck. Clean the outer surface of the thermostat and oil lines with degreaser to prevent grease or debris from contaminating the inside of the thermostat. Put a wrench on the outer nut and firmly but slowly apply torque to loosen. If it's stuck and you have previously applied penetrating oil, you may need to carefully heat the nut with a propane torch and allow it to cool several times. This will expand and contract the nut enough to break the seal between the nut and thermostat threads. This often loosens even the rustiest components and is an excellent alternative to using cheater bars or brute strength. Patience is key here to avoid damaging or catching anything on fire! 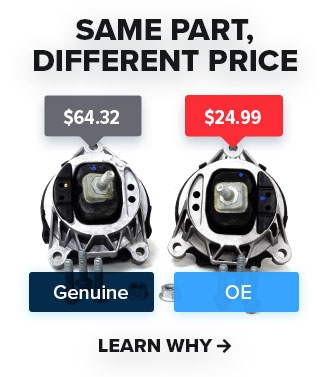 Once the outer nut is disconnected, repeat the same process to loosen the inner oil line nut now that you have access to it. Make sure you have an oil drain pan underneath to catch any drips emerging from inside the oil lines. Moving back to the rear end of the oil lines, loosen the oil line nuts on the oil tank and the end connecting to the engine hard-line. These will be tight but are less likely to be stuck like the thermostat connections. Hold the engine hard-line steady with a second wrench, so it doesn't get bent. 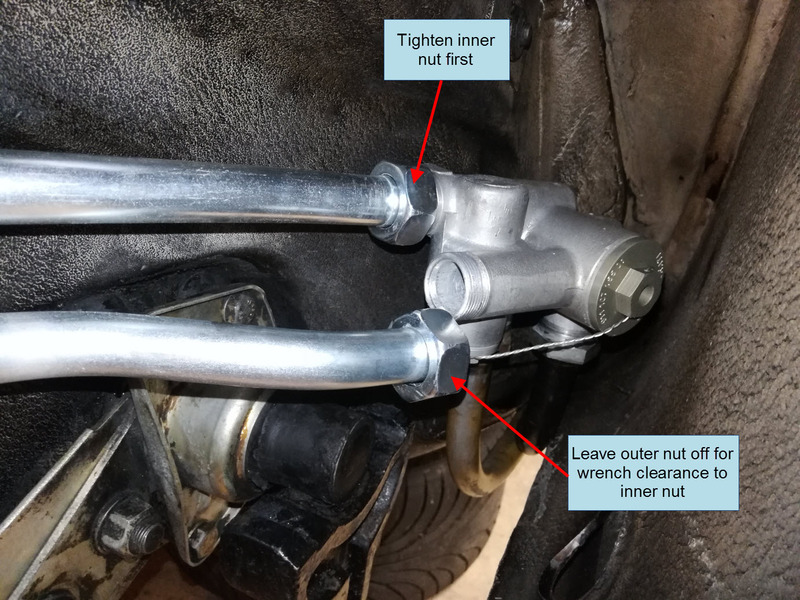 Once all four oil line nuts are loosened, remove the clamp in the center securing the oil lines to the inner wheel well and the 2 rubber pads. Save these for later re-use. The oil lines can now be removed. As you remove them, watch for any excess oil draining from the connections at both ends and catch it with the drain pans. Inspect the male threads at the tank, engine, and thermostat for damage or dirt. Clean them off with a brass wire brush and paper towels as needed. The threads and the tapered sealing surface should be clean, so the new oil lines seal correctly. Now is a good time to clean the inner fender well surface where the oil lines usually sit. 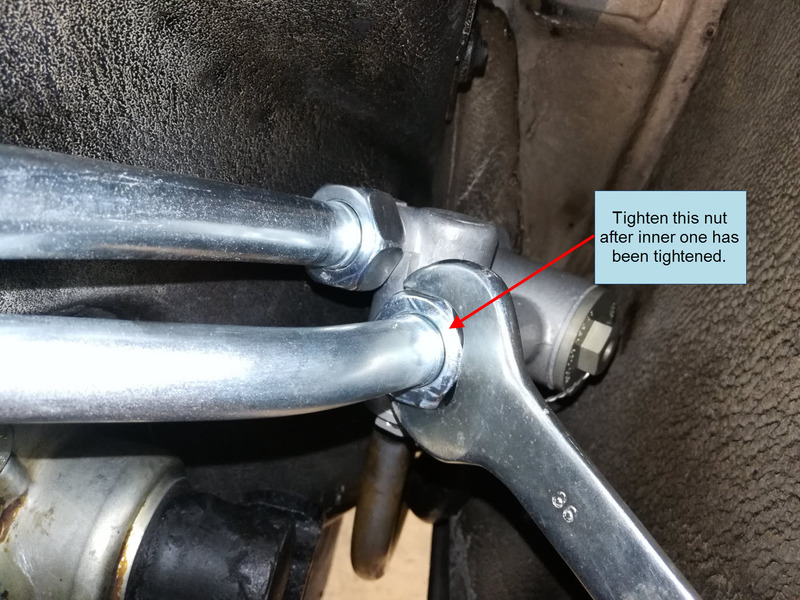 Apply a small amount of anti-seize to each threaded connection and re-install the new lines in the same orientation as before. Install all four connections just finger tight. Loosely install the clamp and rubber pads to allow the oil lines to move around a bit. At each connection hold the hose steady with one hand as you tighten each nut with the wrench to prevent the hose from twisting. Tighten as much as you can by hand. At the thermostat, you will need to tighten the inner (upper) line before you can connect and tighten the outer (lower) line. Hand tighten the clamp nut once all four oil line connections are tight. Follow steps five and six of this procedure to refill your engine oil and check the oil level. Since the right rear wheel is still off, check for leaks around any of the oil line connections. If you see a drip from any of them, you can snug down the oil line nut a bit more. Be careful as the oil lines and exhaust will be hot at this time. Re-install the right rear wheel and lower the car back on the ground. 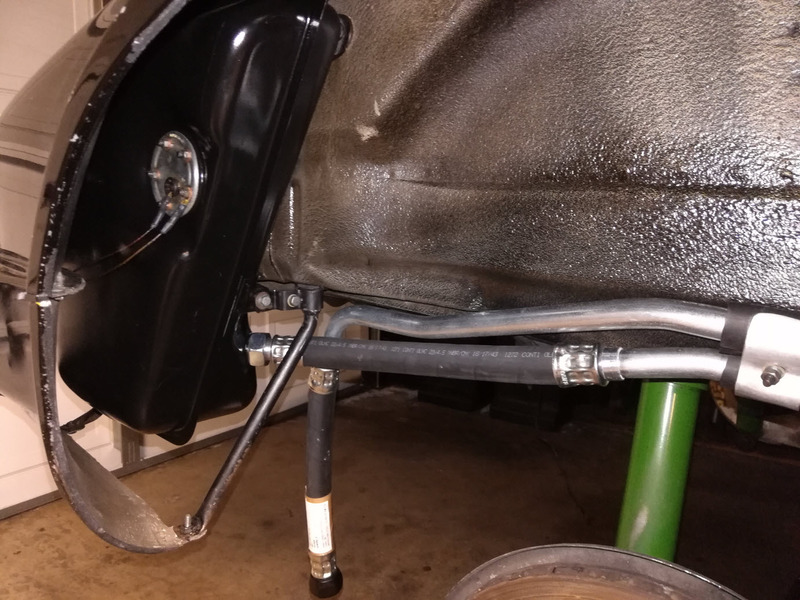 The rear oil line replacement is now complete, so enjoy having fewer oil leaks! If you found this DIY helpful, check back here often for updates and be sure to subscribe to our YouTube channel. If you have any questions or comments about this job or if there are any specific jobs you want to see in the future, leave it all in the comments below!